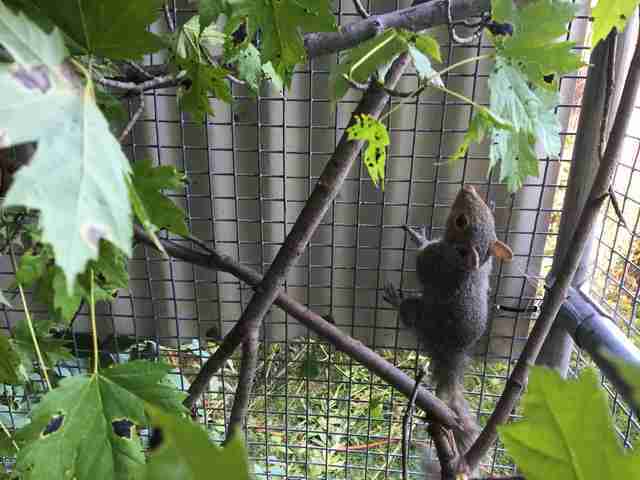 Last Thursday, a Milwaukee resident discovered five juvenile gray squirrels in an odd predicament. The siblings had emerged from their cozy nest only to find that they were hopelessly stuck together, their fluffy tails tangled. The five tails had enmeshed with the long-stemmed grasses and strips of plastic that their mother had used to build their nest. At only 5 or 6 weeks old, the squirrels were just beginning to explore outside with some parental guidance — and were understandably confused by these unexpected growing pains. 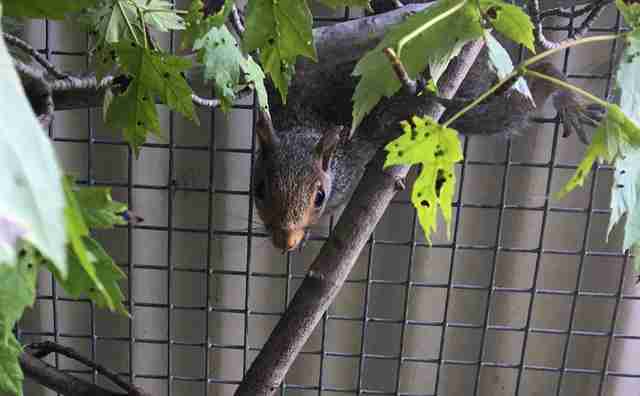 Sensing that the squirrels were in trouble, the woman contained the struggling animals and called the Wildlife Rehabilitation Center at the Wisconsin Humane Society for help. And Diehl, who quickly arrived on the scene, was glad she did. 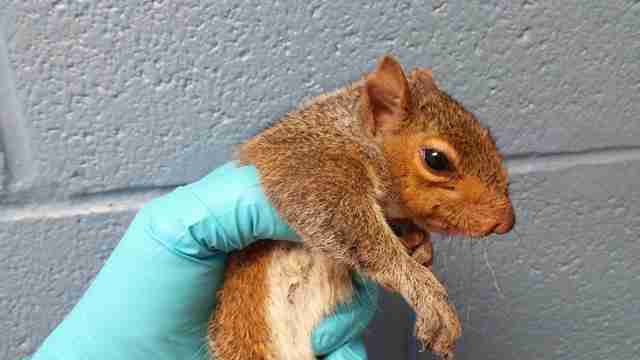 “The squirrels were frightened, very upset and likely in pain,” Diehl said. 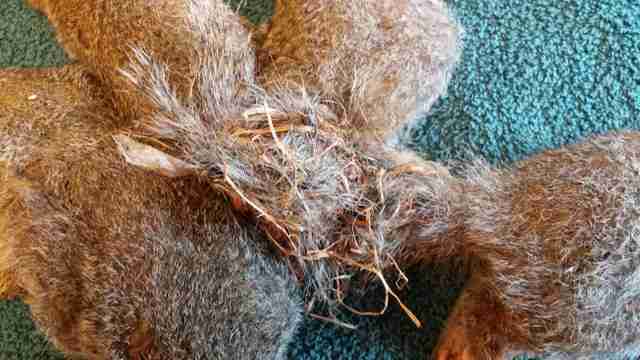 The “wiggly and unruly” young squirrels were brought to the wildlife center and anesthetized before the delicate work of separating the “Gordian Knot” of their tails began. 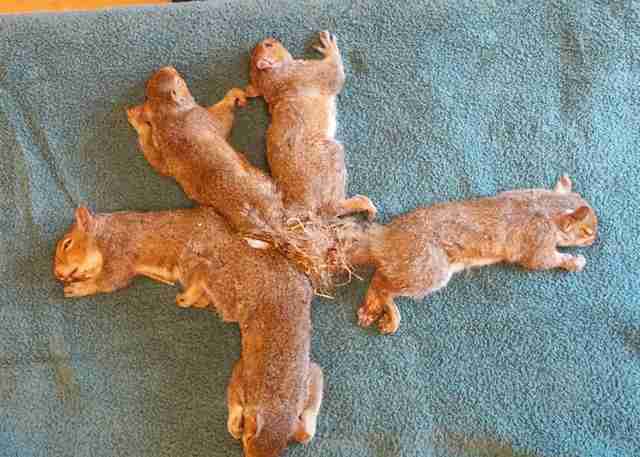 The wildlife team had come across situations like this before, but had never worked with so many squirrels at once. But with sure hands and intense concentration, the team managed to free the tails. Finally able to test their climbing skills, the squirrels are running and jumping around their outdoor enclosure with ease, though some have more fur left on their appendages than others. Luckily, the fur will grow back. Without human intervention, these squirrels could have lost their tails — which are necessary for balance and warmth — and possibly their lives. 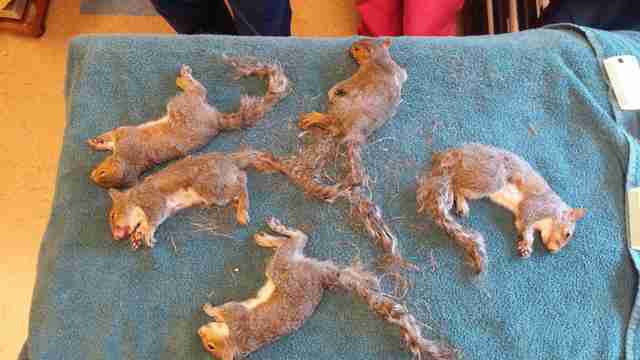 After what this squirrel family has been through, we're sure it will be a very happy reunion. To help support the squirrel siblings’ recovery, you can make a donation to the Wildlife Rehabilitation Center at Wisconsin Humane Society.